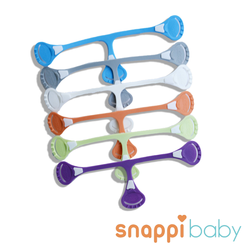 The Snappi Diaper Fastener has revolutionized cloth diapering! This PINLESS diaper fastener offers a practical and reliable way to fasten a cloth diaper and has become one of the most important cloth diapering accessories in the world. Over 60 million have sold worldwide. An EASY to use fastener that offers a PRACTICAL and RELIABLE way to fasten a cloth diaper, replacing the diaper pin. It comes in a variety of colors and is made from a stretchable non-toxic material, which is T-shaped with grips on each end. These grips hook into the diaper fabric to ensure a snug-fitting diaper with enough natural movement for the baby. NOTE: This product is designed to be operated BY persons OVER the age of 12. The Snappi fastener underwent a 'makeover' in 2006. The basic shape and function remains the same, the only change being that the rings on each of the legs have been replaced with a solid piece embossed with the Snappi logo and a crescent-shaped loop at the end of each leg, which gives the Snappi, this EXTRA SAFETY FEATURE! When the Snappi fastener is not in use, fold the loop over the back Snappi end to fit over the teeth of the white grip (see photo to the left). 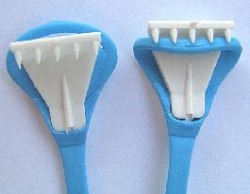 This acts as a barrier and prevents the sharp teeth from being exposed. These loops are NOT to be pulled on when attaching the Snappi fastener to the diapers. When attaching the Snappi, hold onto the solid part of the tab. SAFER THAN PINS - no more pinpricks for baby or parent!! DURABLE - no snaps that can become brittle/rust, nor any velcro to catch all the lint in the wash!! At least if your Snappi® fastener needs to be replaced, your expensive diaper is not wasted!! This unique product was invented by a father who experienced frustration changing his own child's diapers. A snap solution to easier cloth diapering! Snappi®s WORK BEST with terry cloth diapers, cotton prefolds (Chinese or DSQ), and other cloth diapers with a loose enough weave for the Snappi® to hook into. They DO NOT work well with tightly woven diapers.